Construction for the Metro Line 3 is underway. 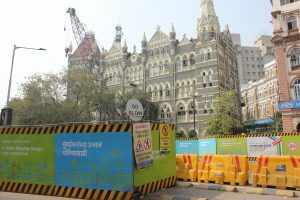 I only realized that they are building the underground metro system when I visited one of my favorite roads in Fort – Dr. Dadabhai Naoroji Road – and saw huge sections of this boulevard under construction. This road which runs from Hutatma Chowk to Crawford Market is one of the most beautiful roads in Fort. Named after Dadabhai Naoroji (1825-1917), a cotton trader and professor at the Elphinstone College, this road displays numerous buildings in the Neo-Gothic style of architecture which were constructed during the 1870s to 1890s. Unlike Metro Line 1 and the Monorail which opened in 2014 and are elevated this line will be Mumbai’s first underground metro system. 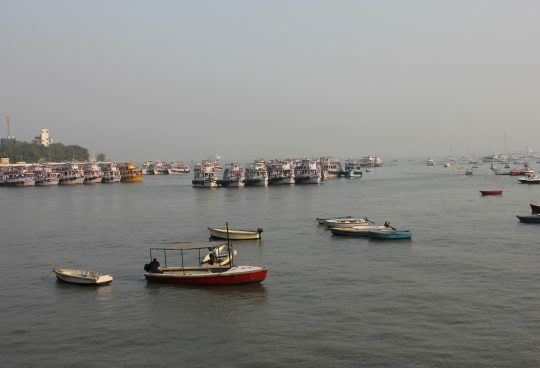 It will connect Cuffe Parade in the south of the city with SEEPZ and Aarey in the north. The line will consist of 27 stations , including stations at Churchgate, Chhatrapati Shivaji Terminus (CST), Mumbai Central, Dadar, Bandra Kurla Complex, Dharavi , Domestic Airport and International Airport. Between Dharavi and the Bandra Kurla Complex the line will pass underneath the Mithi River. The metro tunnel will be constructed beneath the river bed. The metro line 3 is supposed to open in 2020 – this will definitely change how people travel around the city and it will be interesting to see how this will change the city.